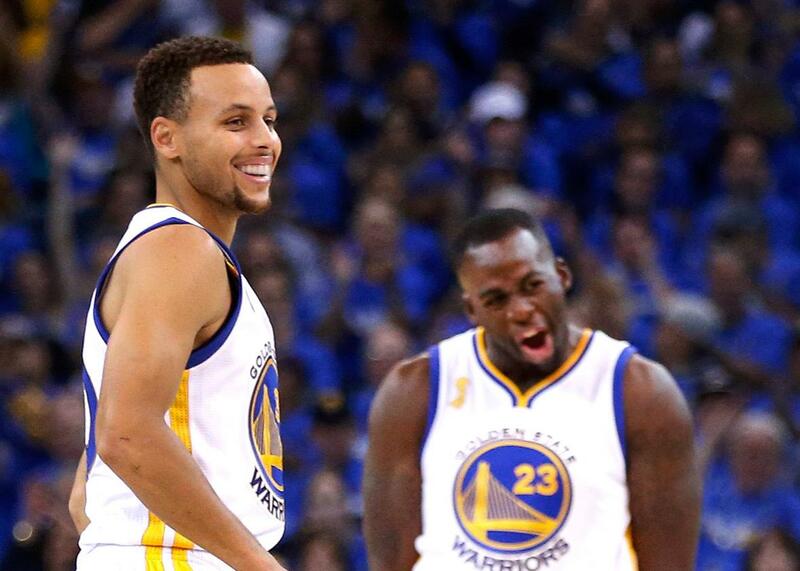 Steph Curry’s Warriors are playing the best basketball ever. Golden State is currently playing better than any basketball team in history. You might want to watch them. Stephen Curry and Draymond Green of the Golden State Warriors during a game against the New Orleans Pelicans on Oct. 27, 2015 in Oakland, California. The Golden State Warriors will probably lose at some point, if not in this calendar year then the next one, or maybe the one after that. This is only sort of a joke. Last season the Warriors won 67 games, tied for the sixth-best regular season mark in the history of the NBA, and capped it off by winning their first NBA title. They have started the season on a record-breaking 18-0 run with a team that’s better than last year’s in nearly every offensive category. The Warriors are scoring almost 116 points per game and beating teams by an average margin of 16. They are being discussed as possible threats to the Chicago Bulls’ vaunted 72-win season of 1995–96. At the start of the season this would have sounded far-fetched; right now the notion of this team losing even 10 games seems even more so. Watching the Warriors play in 2015 is like watching some beautiful, exotic cat absentmindedly torturing a trapped bit of prey. The outcome is such a certainty that you’re there for the destruction, the tragicomic charade that the current victim has a chance. The Warriors are playing revolutionary basketball, but revolutionary in the content more than the form—it’s what they’re doing, and who’s doing it, more than how it’s being done. There are historical precedents for the Warriors’ style of play: The team employs the sort of brilliant ball movement and spacing that helped the Spurs run the Heat off the floor in the 2014 Finals, and their positional heterodoxy and relentless three-point-shooting hearken back to the Mike D’Antoni Suns, the most important NBA team to never win a title. What sets the Warriors apart isn’t so much their system as their personnel—we’ve simply never seen a combination of players like this. Two in particular stand out. The first is Stephen Curry, the NBA’s reigning MVP and arguably the greatest shooter the sport has ever seen. Curry feels like a basketball glitch, an X-Men character mutated to win games of Around-the-World. What makes Curry impossible to guard isn’t just his accuracy but his shot selection—he takes shots no one has ever seriously considered taking, because no one could make them, until now. And watching him play is elementally thrilling: at 6-foot-3 there’s something recognizably everyday about him that isn’t there when watching LeBron James or Kevin Durant or Anthony Davis, players whose physical dimensions alone place them in the 99.9th percentile of human excellence. What Curry does—shoot the basketball at a hoop—is something pretty much everyone who loves basketball has done at some point, and many of us still do. He’s the thing we’ve all wanted to believe was possible all along. Draymond Green is the next evolution of this: Call him the No-Stats MVP. He is a player whose conventional numbers seem quotidian but whose impact is so immense that no one blinked an eye last summer when the Warriors signed the undersized power forward who scored fewer than 12 points per game to a five-year, $82 million contract. Green is the NBA’s greatest Swiss Army Knife not named LeBron James, a player who defends all five positions on the court, is also currently shooting more than 40 percent from the three-point line, and increasingly looms as a triple-double threat. If Curry is the Warriors’ crown jewel, drafted seventh overall in 2009, Green is their heist, snatched up in a stroke of second-round genius. Green spent a full four years at Michigan State under Tom Izzo, and coming out of school he was seen as too small, too weird, too old. But, to borrow from Lewis’ milieu, in Green’s case the Warriors saw other teams’ undervaluing of small, weird and old for what it was: a market inefficiency. Curry and Green are matchup nightmares: The former is an unguardable offensive genius; the latter is a shape-shifter who disrupts game planning with his sheer existence. Together they are the lynchpins of Golden State’s most flatly unfair feature, namely the team’s “small ball” lineup, known more colloquially as the “death lineup” or “nuclear lineup.” This fivesome consists of Green, Harrison Barnes, Andre Iguodala, All-Star shooting guard Klay Thompson, and Curry, a group whose speed and size flummox opposing offenses while tormenting defenses with five three-point-shooters who range from frighteningly credible to unconscionably great. This is the lineup the team customarily sticks in for the last six minutes of games, to rapidly build leads and finish off the opposition. According to Basketball Reference, in 14 games on the court together this year the group has outscored opponents by 90 points while playing a total of only 64 minutes; the Warriors have been blowing teams out so regularly that they haven’t needed to play more than that. This, perhaps, is the most incredible fact of the Warriors’ season so far: They are dominating the league to an extent never seen before while deliberately not playing to their full potential. The aforementioned 1995–96 Bulls are the gold standard of NBA greatness, a 72-win juggernaut that featured the best player in the history of the sport on a psychotic revenge tour after being bounced from the playoffs at the end of a midseason comeback one year prior. In the 20 years since it’s been more or less unthinkable that a team could challenge this mark, but this isn’t the case in 2015–16. Aside from simply how good the Warriors are, this year’s Western Conference doesn’t appear to be the bloodbath of bottom-to-top excellence that it’s been in years past. San Antonio has been fearsome as of late but will likely step off the gas at points during the regular season; Oklahoma City has a new coach who has sometimes appeared overmatched and its superstar Kevin Durant is a constant injury concern. Perennial contenders like the Clippers, Rockets, and Grizzlies, meanwhile, are in varying states of disarray. Despite the sheer brilliance of this first month of the season, something tells me Golden State won’t break 72 wins—the league is tougher and smarter than it was 20 years ago, and at some point the Warriors’ freakishly good fortune in avoiding injuries has to run out—although 70 wouldn’t shock me. In the meantime they are trying to be something just as special: the most purely fun basketball team that has ever played. To non-partisans the 1995–96 Bulls weren’t all that charming; they were a defensive bludgeon playing a quixotic half-court offense chasing their fourth title with all the warmth of a ruthless corporation snuffing out small businesses. The Bulls played basketball in order to win; at the risk of sounding corny, the Warriors feel like they play the game for the joy of playing, the winning coming as a happy byproduct of being so freakishly good at it. For anyone who loves basketball, they’re the best version of ourselves we’ve ever seen.